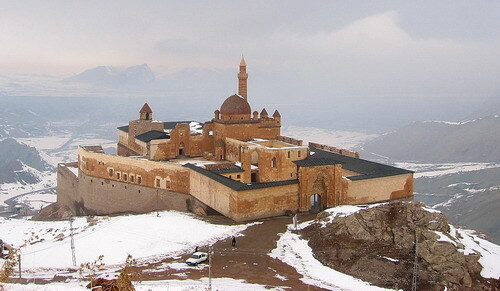 Ishak Pasha Palace – from the town of DOGUBEYAZIT, northeast of Turkey – the border town with IRAN. It is a semi-ruined palace and administrative complex built in the Ottoman period in 1685 by Colak Abdi Pasha, the bey of Bayazit province. It has been closed to visitors until recently because of a war against Kurdish rebellion in the region. It is the second administrative campus after the Topkapı Palace in İstanbul.